An identifying mark for Hertfordshire Training & Enterprise Council that captured something of the spirit of rejuvenation it aimed to bring to businesses in the area. 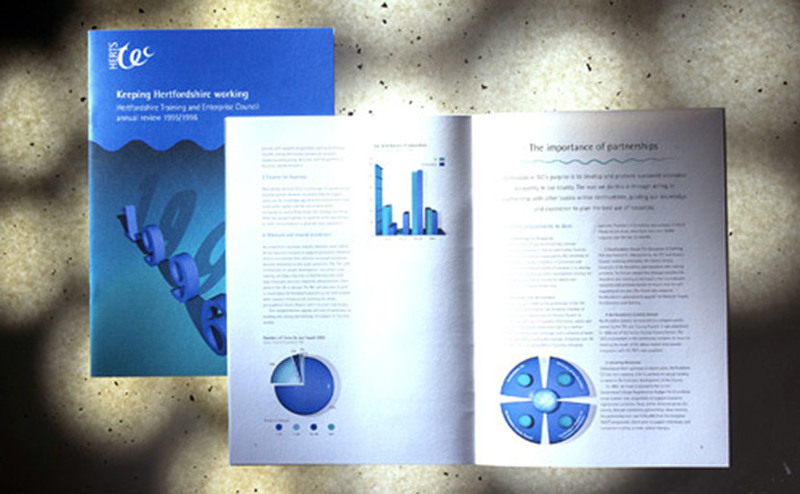 Apart from a basic range of stationery elements we also produced templates for regular newsheets and the first annual report following rebranding. I remember that our preferred choice for cover treatment shown below was rejected by Hertfordshire TEC because many felt that it harked back to a bygone age of heavy industry and engineering – something Hertforshire hadn’t seen in a while. Instead something rather more prosaic was chosen with the numerals of the previous year cast in the shadow of the current one. In many ways this article harks back to a bygone age as well. Hertfordhsire Training and Enterprise Council no longer exists and disappeared around 2002.